This week's issue sees an adventure guide to last year's The Waters of Mars, in which you can discover what is turning people into zombies, and how the Doctor plans to stop it. You can also find out more about the Cybershades from The Next Doctor. The issue also comes with two free gifts: an inflatable monster, and Cybershade tumblers. Out now in the United Kingdom. Friday 5th March sees the launch of National Doodle Day 2010, the seventh event organised by the charities Epilepsy Action and The Neurofibromatosis Association. A number of doodles from celebrities will be auctioned to help raise money to help those afflicted by those illnesses, and this year sees illustrations by Doctor Who companions Catherine Tate, Bernard Cribbins and Elisabeth Sladen, as well as other guests from the show like Michelle Ryan and Russell Tovey. It is also possible to vote for your favourite celebrity doodle. In previous years, celebrities doodles have included those by Peter Davison, Colin Baker, and Louise Jameson; many of these can be purchased on t-shirts and other items in support of the charities from PhotoBox. The auction starts on Ebay from 5th March, and a full list of the celebrity doodles are available on the National Doodle Day website. The Tonner Doll Company has recently unveiled a set of Doctor Who figures to be released this year. Displayed at the New York Toy Fair, award-winning sculptor Robert Tonner has modelled the 10th Doctor, Martha Jones, Captain Jack and Gwen Cooper. The highly detailed 17" dolls include accessories: for example the 10th Doctor comes with a two piece suit, shirt, tie, socks and shoes, and also includes a sonic screwdriver model; a coat can be purchased separately to complete the appearance. The limited edition figures are expected to retail between $170-$200 mark, depending on the character. See the Doctor Who and Torchwood catalogues for more details. You can also see various views of the figures from the Toy Fair Gallery. BBC America has announced that their broadcasts of the new series of Doctor Who will start on April 17th. The date has been reported in the Hollywood trade paper Variety, and has been confirmed on BBC America's website and Facebook page. The start date for UK broadcast has not yet been officially confirmed. There are reports that a trailer has aired with the date of April 3rd, but this may have been broadcast in error. The BBC's official position is that the series will debut "at Easter". After the last few days' media hype, the Bonhams Auction of Doctor Who prop and costumes finally took place today. As expected, of the 163 lots, the Daleks performed extremely well, with the MkI version from Remembrance of the Daleks fetching the best price of the auction at £20,400, with the Torchwood SUV second with a bid of £18,000. 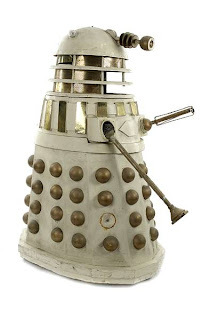 The other "Imperial" Dalek MkII reached £15,600. Of the Cybermen, one from The Five Doctors/Silver Nemesis fetched £9,600, with a destroyed one from The Five Doctors reaching £4,080. Of the costumes, the Tenth Doctor costume from Voyage of the Damned fetched £5,040, whilst Astrid Peth's reached £3,120; Rose's costume from Rose achieved £1,020; the costume for the 'Next Doctor', Jackson Lake, reached £3,120. Other items of interest include: a sarcophagus cover from Pyramids of Mars fetching £4,800; a Chancellery Guard uniform from The Deadly Assassin (as mentioned on The One Show) for £2,280; and the Malus from The Awakening at £3,000. The oldest prop from the series, the brontosaurus model from Invasion of the Dinosaurs, went for £1,320. The cheapest item was a speaker from The Runaway Bride, which fetched £42. You can view all of the props and their final bids below. The catalogue is currently available to see on the Bonhams website. The new edition of SFX will feature a specially-commissioned 3D cover celebrating the return of Doctor Who to television at Easter. Produced in full co-operation with the BBC and the Doctor Who production team, the cover features the Doctor and Amy with a couple of Weeping Angels. The magazine includes an exclusive look at the new series, including interviews with Matt Smith, Karen Gillan, and Steven Moffat. Issue 194 is on sale from 10th March - see the SFX website for more details. John Baker worked for the BBC Radiophonic Workshop between 1963 and 1974, during the time when many special sounds for Doctor Who were made by the department. The auction site Ebay currently an EMS VCS3 synthesiser listed which was owned by the composer, and it has been reported as being used for Doctor Who, and possibly even used for the re-arrangement of the Doctor Who theme tune in the early 1970s (though this has not been confirmed). The item has, unsurprisingly, attracted interest, with the bid at the time of writing at £3877. Running until 4th March, you can view the item on the auction website. You can read more about John Baker at the Trunk Records website. It has been reported that visual effects designer Ian Scoones has died in Bulgaria where he lived with his wife Anastasia, on 20th January. Scoones is perhaps best remembered for his work on Doctor Who in the 1970s for Pyramids of Mars, The Invisible Enemy and City of Death, though he had worked on many other stories, including the very first story An Unearthly Child as an uncredited special effects assistant. He was also heavily involved with the first series of Blake's Seven. As well as television, he worked on a number of films, including Quatermass and the Pit, Nineteen Eighty-Four and Haunted Honeymoon. Having lived in Spain for a number of years he then retired to Bulgaria, but was interviewed by fellow visual effects designer Mat Irvine for the 2008 BBC DVD release The Invisible Enemy, a story he also worked upon. Doctor Who DVD producer 2Entertain have officially confirmed that the Fourth Doctor story The Creature from the Pit is to be released on DVD. The story has been expected since our report in January covered features for the story as having been cleared by the British Board of Film Classification. However, the release date for the story has yet to be revealed. In the next few weeks, American fans will have several opportunities to meet Doctor Who celebrities and celebrate the show. Coming up this weekend (February 26–28) in Los Angeles is Gallifrey One, the largest Doctor Who convention in North America. This year's guests include classic series companions Sarah Sutton (Nyssa), Katy Manning (Jo Grant), Deborah Watling (Victoria Waterfield), Anneke Wills (Polly), Frazer Hines (Jamie), and John Levene (Sgt. Benton). From modern Doctor Who and its spin-offs, actors Tommy Knight (Luke Smith), Georgia Moffett (Jenny), and Andrew Hayden-Smith (Jake) will be in attendance. On the production side, guests include costume designer Louise Page, directors Graeme Harper, Colin Teague and Alice Troughton, polymath Nicholas Briggs (voice of the Daleks, actor in Torchwood: Children of Earth, writer and producer for Big Finish Productions), script editor Gary Russell and writers Bob Baker (co-creator of K9 and the new K9 TV series), Phil Ford (head writer for The Sarah Jane Adventures, and writer for Doctor Who and Torchwood), John Fay (Torchwood: Children of Earth), Rob Shearman ("Dalek" and the short story collection Love Songs for the Shy and Cynical) and Paul Cornell ("Human Nature" and Marvel Comics). Pre-registration for Gallifrey One is closed, but on-site registration will be available from Friday morning. Gallifrey One is held at the Los Angeles Airport Marriott Hotel. There are also events coming up for Doctor Who fans on the East Coast. On March 7, Who York will host "A Who York Evening with Russell Tovey" at Cafe 50, 50 W 22nd St, New York. Tovey played Midshipman Frame in the Doctor Who specials "Voyage of the Damned" and "The End of Time", and also stars as the werewolf George in the BBC series Being Human. The Who York event will include a Q&A and an autograph session. If you want to see Tovey, but New York isn't convenient, you can catch him and Doctor Who legend Nicholas Courtney at a special Pub Night being hosted by Hurricane Who. Courtney, of course, has played Brigadier Alistair Gordon Lethbridge-Stewart for over 40 years. "Hurricane Who: Greyhound One" will be held on March 11 at the Cricketers Arms pub in Orlando, Florida, and will include a Q&A, meet-and-greet, and episode viewings with both Courtney and Tovey. The Sun's latest casting news reports that Gavin and Stacey writer/star James Corden will appear in the new series of Doctor Who later this year. The actor was said to have been seen learning his lines on train to Cardiff, and confirmed the news when approached by a fan. We normally keep our guest stars under wraps but you can't hide a bloke like James. He loves coming to Wales, and it gives him a chance to meet up with Ruth Jones, who co-wrote Gavin and Stacey with him and starred as Nessa. We're just delighted to have James on board. He is a great actor and he'll be a perfect fit for the new Doctor Who. The actor's role in the series has yet to be revealed. A fantastic adventure through Time And Relative Dimensions In Space as our very own Time Lord has close encounters with out of this world favourites from large and small screens. The programme includes music from Dr Who, a musical tribute to Star Trek, as well as music from Star Wars. Mankind’s giant leap is remembered and we pay a visit to our nearest planetary neighbour with a movement from Holst’s Planets Suite. Come in your best outer space gear for a truly intergalactic experience! Best of all - come to the Phil from 1.30 pm to meet all your favourite Dr Who and Star Wars characters! It’s extraordinary. There’s no doubt the RLPO plays to more children than any other orchestra in the UK, if not Europe. For me I think a successful family concert should have all the same things as a successful family day out. Like a theme park for example – the moment you wake up the children are excited. Then the event itself should have all these elements of excitement and surprise and discovery. Then afterwards you have the shared experience as a family and with any luck you’re going to talk about it. The concert is on the 7th March at 2:30pm at the Liverpool Philharmonic Hall - see their website for further information and to book tickets. BBC Worldwide have signed a deal with Sony Pictures Television for some 114 hours of entertainment to be shown across Central and Eastern Europe, including countries like Poland, Romania, the Czech Republic, Serbia, Slovenia and Montenegro. The package includes Doctor Who, Torchwood, and Primeval. We are delighted to secure such a fantastic selection of BBC shows for AXN and AXN SCI-FI. The addition of these exciting new titles to our schedule further reinforces our channels’ reputation as the destination for world-class TV entertainment in Central and Eastern Europe." The press release comes from the BBC Showcase event taking place in Brighton; the show enables BBC Worldwide to promote television programmes to potential buyers from around the world. This Wednesday sees the Bonhams Auction of many Doctor Who costumes and props take place, and the auction rooms are now open for public viewing up until Tuesday. Entrance to both the viewings and the auction is by purchase of the auction programme, which costs £15.00 (£5.00 goes to the charity Children in Need). Stephanie Connell, entertainment specialist at Bonhams said: "Doctor Who is without doubt one of the most important and best loved television programmes, and we are delighted to have the opportunity to offer some of the iconic costumes and props from the show." As might be expected, the media is taking an interest in the auction, most of which revolves around the sale of two Daleks which featured in their last 'classic' story, Remembrance of the Daleks (MKI and MKII versions). The BBC1 magazine programme The One Show is expected to run a feature on the auction on Tuesday evening, from 7:00pm. For full details on the auction, including openings times for public viewing, see the Bonhams website.